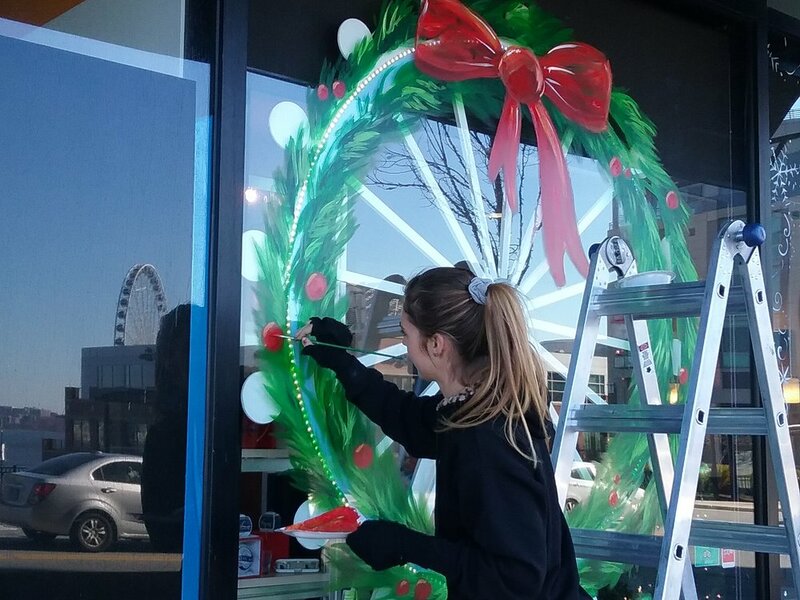 In preparation for the holiday season, Kira Milligan paints the Capital Wheel 2017 window display for their storefront in National Harbor, Maryland. The Capital Wheel, a ferris wheel on the National Harbor's waterfront, provides views of the Potomac, the DC and Alexandria skyline, and the surrounding Prince George's County area. 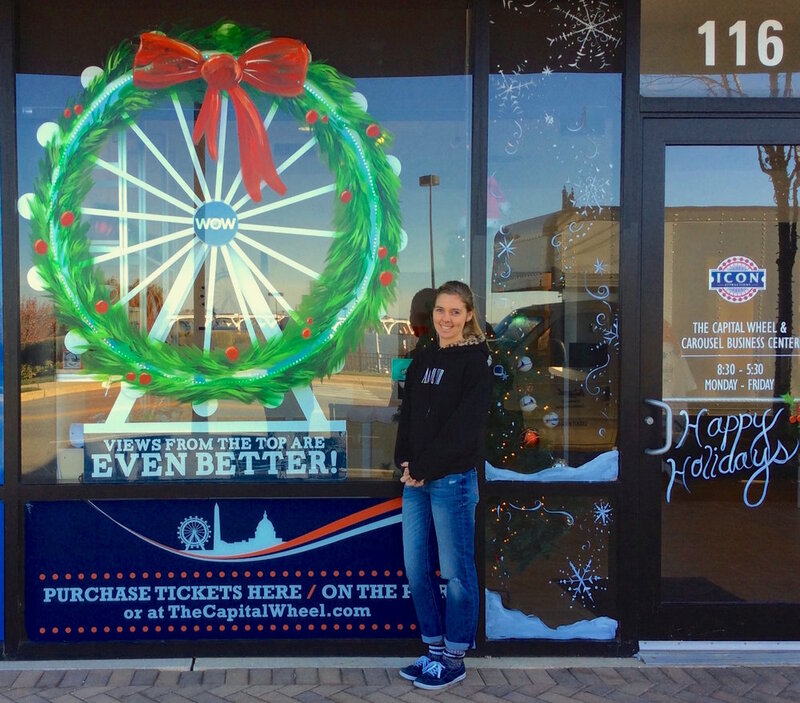 For more information on the Capital Wheel, visit thecapitalwheel.com, and to see a full list of this holiday season's events hosted by the National Harbor, visit nationalharbor.com. 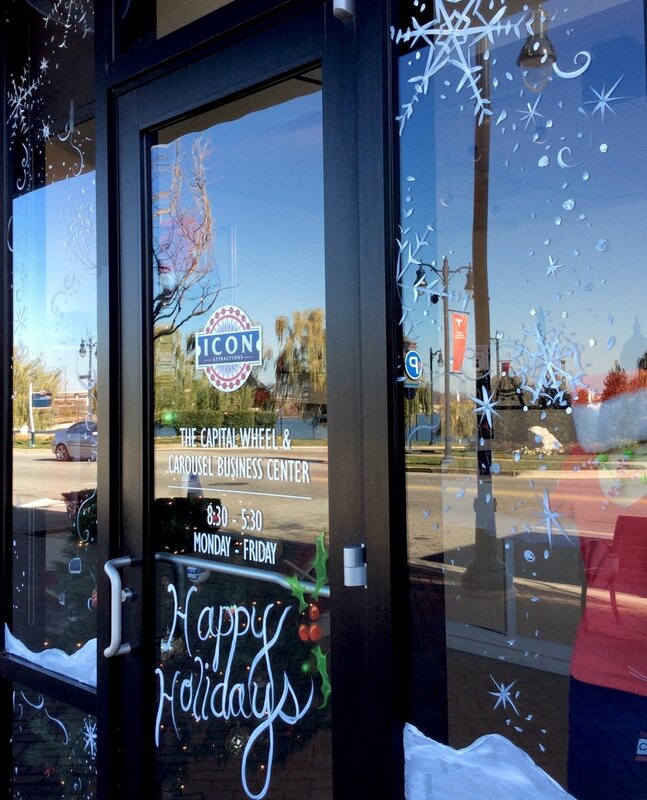 To see Milligan's complete hand-painted window display, stop by the storefront at 116 Waterfront St., in the National Harbor. Follow @kiramilligan on Instagram for more frequent updates on new pieces. Original pieces shown below are available for purchase at 122 Waterfront Street, National Harbor, MD. Pieces can also be shipped within the United States- please contact the artist for further questions on pricing. Original piece by Kira Milligan also available for purchase from the Savannah College of Art and Design on ShopSCAD. See artist bio here and click image below to visit the corresponding page or to purchase the piece. Airplane View Sketch, 2017, acrylic on canvas, 48" x 72"
Stretching large raw canvases and using gestural strokes of acrylic, Kira Milligan uses a compilation of reference aerial photos to sketch memories of looking out of an airplane window at the East African landscape below. Watch this news page for detail shots when the piece is completed, and updates as the artist continues to experiment with this scale and medium. See detail shots and finished piece below. Art Instructing in Washington D.C.
7th grade students work with watercolors in an introductory art class. In addition, Milligan simultaneously works on independent projects and a commission painting for the school's newly renovated coffee shop. Using RVA's art facilities as a studio (below), with the scenic Rift Valley as a backdrop, Milligan paints a favorite local restaurant with a wistful approach. Returning to live and work in Washington D.C. at the end of February, Milligan stays busy- giving back to RVA, and learning from students and staff members alike. At the end of her last semester of studies at the Savannah College of Art and Design, Kira Milligan helped to organize and participated in an international exhibition in France. The Lacoste Open Studio Exhibition rounded out the end of the school's study abroad program that gave 88 participants an intensive 9 weeks of traveling and producing work. 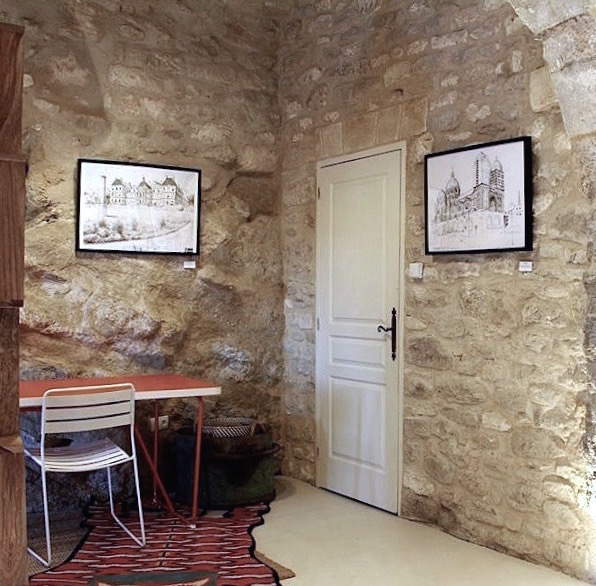 Curated by William Ruller, along with Sarah Horan, Jason Kofke, Matthew Landrus, and Jeremy Moorshead, the exhibition was held throughout various gallery spaces in the preserved medieval village of Lacoste. Kira Milligan showed 6 works on paper and 2 sketchbooks in this vernissage, all of which were made during this residency in Lacoste. For more information on the exhibition, see previous post. For high-resolution images of the works included, see pages, Architecture and Lacoste, France. On Friday, November 11th and on Saturday, November 12th, the Savannah College of Art and Design presents a curated Open Studio Exhibition at the Lacoste, France campus. From 2 p.m. until 7 p.m. on both days, 88 students will participate, showing everything from prints and photos to paintings and storyboards, many of which convey a personal approach to the experience of living in Provence for 2 months. Refreshments served and work for sale in 7 different gallery spaces around the quaint village of Lacoste. Graduating senior Kira Milligan will have work in multiple galleries, showing paintings celebrating unfiltered light as well as large architectural drawings with irregular scribbling alongside uniform mark-making. Several of her sketchbooks will also be exhibited, giving insights into her process of documenting places and details. Following a short, but richly-packed week of visual stimulation spent studying in Paris, Kira Milligan writes for the SCAD Painting Lacoste blog on what drove her to fill a 30 page sketchbook in 4 days. SCAD Painting Lacoste: New Blog! Are you dreaming of experiencing Southern France from an artist's perspective? Live vicariously through the SCAD Painting Lacoste Blog, featuring everything from quick sketches to stunning paintings- from weekly excursions around Provence to five art-packed days in Paris. Who are the geniuses behind this marvelous virtual experience? We are a group of artists from the Savannah College of Art and Design, coming together from all corners of the world to share this unique opportunity to study abroad in Lacoste, France. 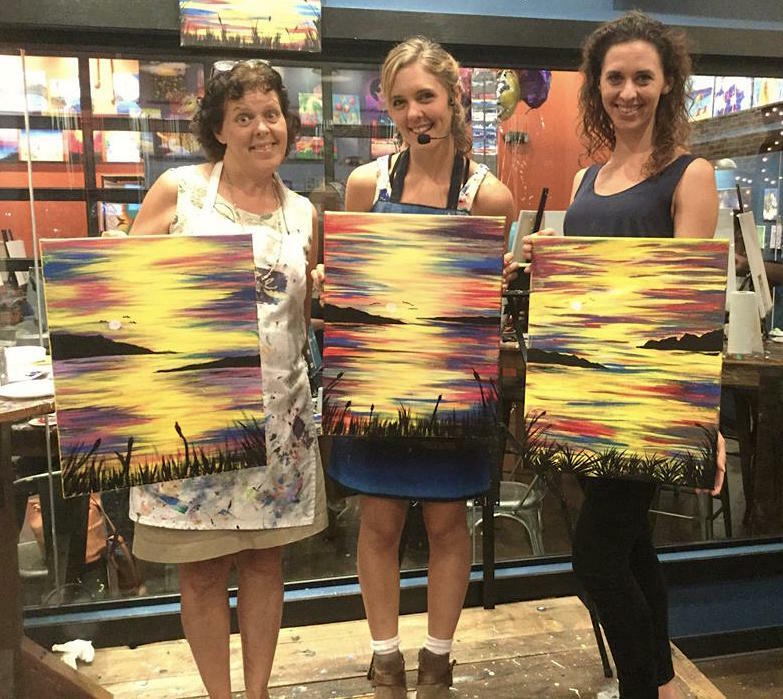 Our mission is to EXPLORE, LEARN and PAINT! On Friday, Oct. 21st, the SCAD Painting Department hosts its annual Fall Open Studio Event. A juried selection of SCAD student artwork is on display in the upstairs gallery of Alexander Hall (668 Indian St., Savannah, GA), where guests will also have the opportunity to view in-progress works in the studios of graduate and senior Painting students. Though Kira Milligan is currently studying in Lacoste, France and will not be present at the Fall Open Studio, five of her works (three of which are pictured above) are on display and available for purchase. Kira Milligan will be spending eight weeks studying Landscape Painting and Architectural History, combining a love of the landscape and the built environment to fill sketchbooks and produce works on paper. Stepping away from her current painting practice of starting with photo-references from her home in Kenya, Milligan will instead work en plein air, immersing herself in the French landscape. A Look into the Process of: "Mt. Kenya Curio Shop"
Above: The Savannah College of Art and Design names Kira Milligan the 2016 undergraduate recipient of the School of Fine Arts Outstanding Academic Achievement Award. Rounding out the 2015-2016 academic year, the Savannah College of Art and Design recently presented 21 graduating Painting seniors in a diverse group exhibition at the Alexander Hall Gallery in Savannah, GA. The exhibition was juried by the faculty of the painting department as well as Amanda York, the SCAD assistant curator of exhibitions. The reception took place on Friday, June 3rd, and included an award ceremony, judged by guest curator, Aaron Levi Garvey. 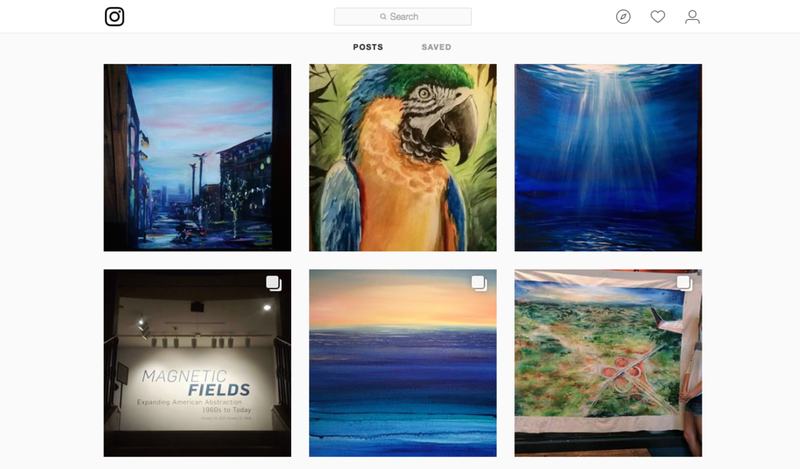 For more information, see the SCAD Painting Department Blog. Nostalgia abounds at "In-Between Paradise"
The night of June 2nd, 2016, nostalgia was in the air. Painting senior Kira Milligan and Photography senior Alexis Hagestad were just two days away from graduating from the Savannah College of Art and Design when they brought together family, friends, out of towners, law enthusiasts, local art-lovers, and more for an exhibition reminiscing landscapes. 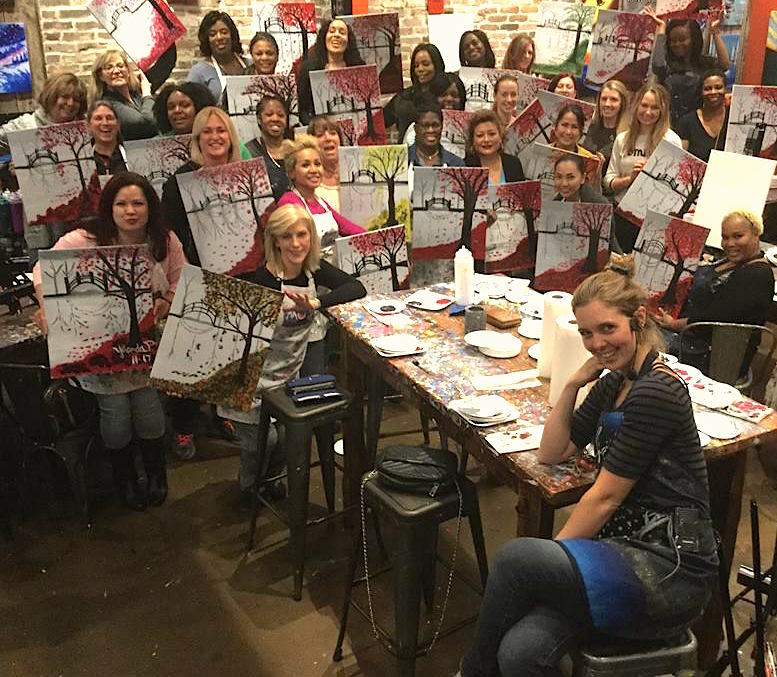 Surrounded by Hagestad's dreamy Savannah-scapes and Milligan's wistful recollections of home, the night was full of new introductions alongside touching goodbyes. The art sparked a sentiment of retrospect: remembering life-in-transition and examining land-in-transition. "In-Between Paradise" uses reminiscant landscapes to question notions of idealism, while highlighting human alterations to the land. While the artists come from differing backgrounds and disciplines, both Hagestad and Milligan explore the environment's ability to evoke nostalgia. The exhibition is located on the 4th floor of the Savannah Law School, at 516 Drayton St., Savannah, GA.
On the night of Friday, May 20th, the group exhibition INHABIT, including artists Cassandra Benevento, Haley Howard, and Kira Milligan, invited the public to engage in a dialogue surrounding humanity and the environment. The show's success provided a percentage from the sale of artwork to be donated to the Georgia Nature Conservancy. Visit the exhibition website to see more photos from the show. Oglethorpe Gallery is pleased to present Inhabit, a group exhibition featuring artists Kira Milligan, Cassandra Benevento, and Haley Howard, on May 20th - May 23rd, 2016. The exhibition will showcase their separate bodies of work that are woven together by their interests in the interactions between humanity and the environment. 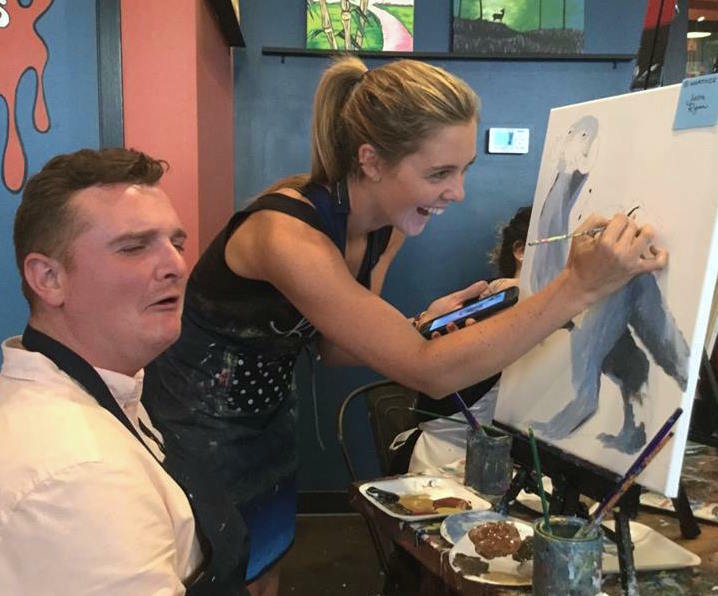 While the three artists all work with oil paint, the stylistic approaches, subject matter, and paint application varies greatly from one artist to the next.